Close crawl space vents and cover the crawl space floor with plastic (at least 6-mil) to reduce soil moisture. A 25 percent bonus rebate is available on new LED fixtures for any project pre-approved, completed and submitted for final payment by Nov. 15, 2019. 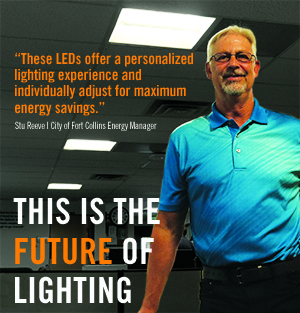 Receive cash incentives for lighting retrofits in existing buildings, helping reduce electric bills and improve lighting quality. Begin by contacting your contractor, or find one through Efficiency Works. Incentives are based on the wattage reduction from the new to old lighting equipment and typically cover 25-50% of the project cost. Incentives available until funds are expended. Pre-approval required for projects with incentives estimated to be greater than $1,000. Wattage reductions are calculated based on standard program equipment values (see applications). All indoor and outdoor lighting is eligible. Exterior lighting may be required to be full cut-off or dark sky compliant. Check local land use and building codes. LEDs must be on the DesignLights Consortium™ products list or Energy Star Retail to qualify. Payment made upon project completion after submission of a signed application and copies of project-related invoices. This program is a collaboration between Fort Collins Utilities and Platte River Power Authority. Need help finding a contractor? Efficiency Works can help you get started.